Is it snowing in Peyragudes ?¡Gracias! The resort of Peyragudes, located in the heart of the central Pyrenees, is relatively unknown outside of France and Spain. The vast domain of Peyragudes has two base areas, the first Les Agudes (the less attractive of the two) has an old feel to it with dated buildings. However, this area has a large learner area and is best suited for first time skiers. The second base area (Peyresourde village) has a completely different feel, with a superb choice of restaurants facing the slope as well as shops and ski hire right next to the lifts. This area is normally bustling, and is especially busy during the main school holidays. Peyragudes ski area is well linked with a mix of modern lifts and a few slower chairs though, in general, there are rarely long queues. 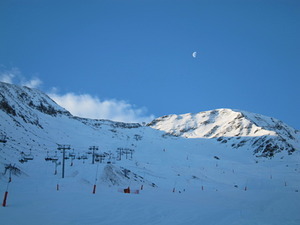 Though the skiing is above the tree line, the scenery is excellent, although, in poor weather, the runs can be difficult to navigate at the top of the resort. From a skiing and boarding perspective Peyragudes boasts 60km of pistes, and with a good snow record and vast snow making capability the pistes will remain in good condition throughout the season, and will satisfy skiers and boarders of all abilities. Because of the natural terrain there is a superb amount of off-piste available making this also an ideal playground for those that prefer to have fun away from the main pistes. Above 2000m, on the Peyresourde side of the domain, there is a fantastic snow-park for both boarders and skiers alike with its own snack bar and decked terrace. Behind this there is also a boarder-cross course that ends at the superb restaurant at 2000 metres with a large outdoor seating area and fantastic views across to St Lary Soulan. 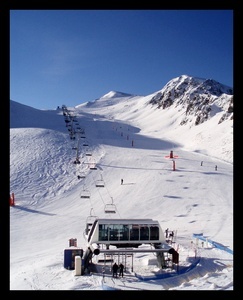 Both base areas have accommodation though many skiers will find staying at one of the many hotels, apartments or chalets in Luchon as the ideal base as this not only provides a good apres-ski option but also the ability to ski at other resorts within the area. Peyragudes has continued to develop the station, in particular the base area of Peyresourde where another new accommodation centre has been constructed at the foot of the piste beside the Privilege chairlift. This development also includes new restaurants and cafe's along with a spa managed by the Balnea group. In addition this season will see a terrain set aside for dedicated ski de randonnee. Peyragudes will provisionally open for the weekend of the 29th and 30th of November (weather permitting), the 6,7 & 8th of December (Spanish holidays), 13th and 14th of December, then continuously from the 20th of December until the 6th of April. J'ai beau être désolé pour le desastre de cette saison et j'ai beau comprendre les dificultés des stations des Pyrénées avec ce manque de neige ça me met un peu les boules que les webcams de peyragudes soit éliminés ou recadrées dès que l'on s'apecoit qu'il n'ya absolument de neige sur la station! S'il ne neige pas bientôt on n'aura plus qu'une webcam sur une tartiflette qui cuit!! !